An expanding ageing population that gives rise to new health needs related to older age. Restrictive fiscal policies, aiming at making sustainable budgetary adjustments in the economies, but that simultaneously squeeze availability of resources. New technologies and inventions that are pressingly looking for ways to ‘intrude’ in existing production and service processes. Stakeholders that exploit innovations seek for a fair return for their investments. Incumbent and well-established processes related to health services delivery demonstrate fierce resistance to new technologies and inventions, in an effort to extend their time horizons. Accessibility to a variety of medical and wellness information through the Internet channels surge. This is both a curse and a blessing since it enhances transparency and competition, but could also confuse or even lead to concerns and distrust among both providers and those in need of healthcare. The multiple counter-forces that are seeking consolidation are evident and the exigent demands for finding a sustainable solution are becoming an even more urgent cause for change. The annual change of per capita health expenditure in Greece dramatically dropped during the period of the economic crisis from an average growth of,% in the period between 2005 and 2009, before the crisis, to a drop of – 6,6% in the period between 2009 and 2015 (OECD, 2016). However dramatic this drop may seem, there are still significant public and private resources being pumped into the sector, although the burden is constantly shifting toward the private sector. Health expenditure, as a percentage of GDP, was 8,4% in 2015, a relatively high level, close to the OECD average of 9% of GDP (OECD, 2017). It supports 26.000 direct jobs and 86.000 total jobs. The additional contribution of the industry by 2021 could be at least €2 billion and create additionally 25.000 high-skilled total jobs. 18% (or appx. €150 million investment) of total R&D expenditure in Greece is attributed to the Pharma sector alone. The aggregate contribution of the sector to the Greek economy is 3,5% of GDP or €6.1 billion. Medicine is the 2nd largest export product of the Greek economy (with a total value of €1 billion) and exports to 100 countries have increased by 10% in the last 3 years. The sector contributes €400 million in taxes and social security contributions. €1 billion in domestic pharmaceutical product output. Innovation in the health sector could be expressed throughout the supply process. Therefore, medical equipment, hospital and outpatient infrastructure, integrated care service provision, as well as soft parameters such as therapeutic and diagnostic protocols, Big Data and Real World Evidence analysis processing and outcomes, and therapy adherence monitoring, are elements that could lead to healthcare innovations. A pivotal force, that has a horizontal effect in all of the above, is pharmaceutical innovation. At this point, I would like to share some numeric evidence that underline the value and importance of pharmaceutical innovation of healthcare in Greece. Due to the introduction of innovative medicine solely, almost one whole year was added to life expectancy in the period 1995 – 2010. This also resulted in the reduction of the hospitalization days by an average of 2,2% annually, for the period 2000 – 2008 (Lichtenberg, 2015). Also, according to other pharma industry estimations, pharmaceutical innovation could save resources by reducing other expenditures, i.e., for every $24 spent on cardio medicine, $89 are saved due to reduced hospitalization costs (private pharma company data analysis results). In terms of the quality of employment in the pharmaceutical production sector in Greece, the majority of the work force (61,3% or more than 8.100 employees) have university level education, indicating the high level of intellectual capital in the sector. This high-skill level is threefold compared to the total manufacturing sector, where only 19,3% have university degrees (IOBE, 2013). Looking into the employment performance and resilience of the pharma sector along the recent economic cycle in Greece, the sector, as expected, had a decrease in employment in terms of equivalents of full-time employment by – 6,2%, but it is worthwhile noting that this was the smallest drop of employment within the whole manufacturing sector during the period 2010 – 2015. During that same period, surprisingly so, the salary cost in the pharma sector remained almost stable, in comparison to a very significant drop of – 34,4% in salaries in the overall manufacturing sector. Furthermore, the hourly wage for the pharma sector was €11,7 in comparison to €6,8 for manufacturing and an overall hourly wage for the whole economy at €5,2 (Eurostat, 2016). Finally, looking into some key comparative figures on life expectancy in Europe, Greeks live 5,5 years longer, on the average, than people that live in the eastern European countries. And one can argue that a large part of this positive differential is due to the introduction of innovative medicine and access of the population to this during the last decades. How about overall innovation and entrepreneurship in Greece? Let’s now take a glance at the overall status of innovation in Greece. Firstly, the country ranks relatively low in the European Innovation Scoreboard. Greece is in the middle of the category of ‘moderate innovators’, ahead of the ‘modest innovators’, and ranks in the 19th position among EU-28 (Innovation Index SII, 2016). Most of the other EU countries fall into the ‘strong innovators’ or innovation leaders categories. Concerning entrepreneurship in Greece, the results of the recent Endeavor Survey (Endeavor Greece, 2017) reflect what can be foreseen by the moderate status of innovation in the Greek economy. According to the study, 84% of the businesses created relate to introvert sectors and only a very small part, 16% of the business, relates to export oriented sectors. These sectors typically are associated with innovation intense activities as a way to be competitive internationally. Moreover, overall business initiation dropped by 50% in 2016, as compared to the level of 2008, and this could partly be an indication that many new entrepreneurial ideas do not manage to end up in real business creation. So from a macroscopic viewpoint, how can pharma innovation support healthcare systems and economies to meet the current challenges? Healthcare systems globally are facing a significant challenge to be able to keep up with the rising needs of the population and at the same time manage to provide quality and sustainable healthcare and cope with increasing medicine and hospitalization costs. Simultaneously though, biopharmaceutical companies invest trillions in R&D to cover unmet medical needs. Innovative medicines produce important savings for healthcare systems by reducing spending on hospitalizations and other health services, and allowing people to live longer and healthier. Pharma innovation further has a positive spill over impact on the economy by increasing the productivity of a healthier population. Adding qualitative employment and increasing quality of life. Hence, health is actually growth. And, in turn, growth could support a healthier society. Unlocking the potential for a strong healthcare sector in Greece is not only a driver for entrepreneurial growth, but could also serve as a stabilizing factor during recessions, while at the same time supporting people’s prosperity and wellness. So adopting a health economy approach is in effect transforming a societal need into a development opportunity, constituting a win-win arrangement for both governments and citizens. What this requires is to strategically be able to functionally integrate medical and technological developments as a way to address the challenges and compromise counter-forces in democracies. Increasing health awareness imposes pressure on political stakeholders, who are becoming more and more sensitive to these issues. Therefore, instead of viewing healthcare as a cost factor, we must view it as an investment. And there are measurable impacts of the Health Economy on economic growth, employment, and the health indices of the population. The findings of the research conducted by Dr. Dennis A. Ostwald and Dr. Klaus-Dirk Henke at the Wirtschaftsforschung Institut – WifOR (see Note 1) on the German economy for the period 2005 – 2008, provide fundamental arguments for adopting the new understanding of the health economy, as an integrated part of the healthcare system. The health sector in Germany was classified as a labor intensive and one of the fastest growing, innovative and extrovert sectors, features that gave the sector a stabilizing nature, especially during the downturn of the business cycle. In 2008, 1 out of 7 people were employed in the health sector, a total workforce of 5,6 million people. During that same period exports of the sector represented 7% of total exports of Germany, a total value of €73 billion and the added value created was estimated at €224 billion, that is equivalent to 1/10th of the economy! In fact, the results demonstrated strong links of the health sector within the extended supply chain and this resulted in a strong indirect effect in production, earnings and employment of the related sectors, as well as a strong induced impact on consumption. Hence, in 2007, the total added value created by the health sector was €386 billion (€214 billion due to its direct impact and €172 billion due to the indirect and induced impact by the related increased consumption). And, most impressively, for every two jobs in the health sector, an additional job was created in other sectors. 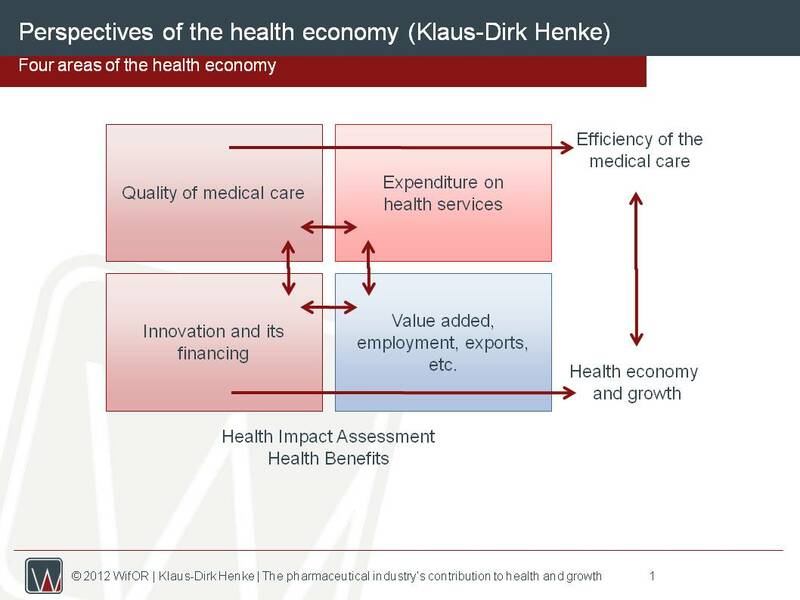 What I have presented in this article clearly demonstrate that the Greek economy has a strong basis for a Health Economyapproach (see graph Perspectives of the Health Economy – The four sectors). This, however, requires the adoption of a policy philosophy that integrates society’s dual needs for healthcare and growth. It requires collaboration among all involved in the healthcare ‘ecosystem’, a strong focus on patients’ needs and value-based therapeutical outcomes, and the active engagement of health care professional. Also, such an approach is a top EU priority (see Note 2) and Greece has all the prerequisite conditions. There is no other way out of the social and economic crisis the country is going through than that of implementing win-win solutions that could optimize the capacity of the economy to exploit innovation and global trends and in parallel to serve social needs. And the health sector is the way to go! Dr Alexandrakis Emmanuel is an Economist and Health Sector Strategy Consultant, and Adjunct Professor at i-MBA. Eurostat, National Accounts (2016) – data elaborated by ΙΟΒΕ – The Foundation of Economic and Industrial Research. ΙΟΒΕ – The Foundation of Industrial & Economic Research – (2013), “Financial impression of production and sale of medicinal products in the Greek market”. Lichtenberg, F.R. (2015), “Pharmaceutical Innovation, Longevity, and Medical Expenditure in Greece, 1995–2010”, International Journal of the Economics of Business, 22:2, 277-299. OECD Competition Assessment Reviews: Greece (2017), Chapter 6 – Pharmaceuticals. Ostwald, D. A. / Henke, K.-D. / Hesse, S. (2013), “Das Gesundheitssatellitenkonto: Der zweite Schritt: Wertschöpfungs- und Beschäftigungseffekte der regionalen Gesundheitswirtschaft”. In: Luthe (Hrsg. ), Kommunale Gesundheitslandschaften, Band: Gesundheit / Politik / Gesellschaft / Wirtschaft.